The variance was granted tonight in a unanimous vote. Praise. The. Lord. The dude that went just before us got his granted too and then he asked a clarifying question that unraveled his whole case, causing the board to rescind the granted variance and postpone the vote. (Stupid man.) This scared me to death, but between Scott’s good looks and my charm, they listened to our case and nobody caused a problem. We hung out for 4 hours before our case was heard, but we learned a lot in the process. This gives me some hope that the below plans will actually happen. We still have to go back to the city to have them consider our permit application with the granted variance, but hopefully this will only take a month or so. stay married throughout the whole thing. I can’t wait to follow along as all of this happens. So exciting! Is your entry in the right side of the livingroom? Do you have to go through the livingroom and dining to get to the master and kids bedrooms? Hey Kathy! The entry is on the left side of the porch and living room. By walking through the living room to the right, you get to the dining and kitchen. Walk the other direction straight through the living room and you get to the bedrooms. Clear as mud? 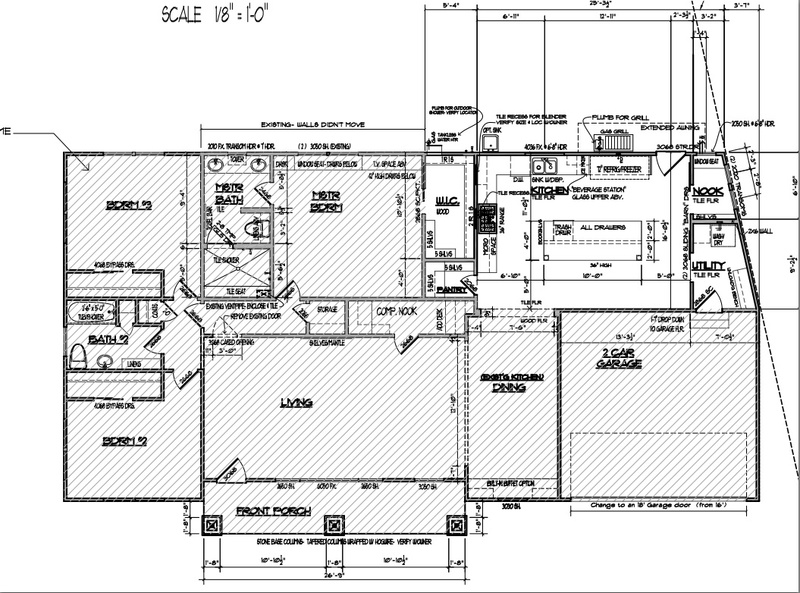 If you click on the floor plan image, it will supposedly be shown larger. You are dear for being interested! Come to Austin and help us decorate the place!